The trailer was one of the best trailers in recent times. The cast included such strong actors as Momoa (Stargate: Atlantis), Perlman (Hellboy) and McGowan (Charmed). The source material was one of the best ever. The previous incarnation was a box-office success which cemented Terminator Arnie has a Hollywood heavy-weight. Morgan Freeman was the erstwhile narrator of the movie. So where the hell did the film go wrong? Whenever Hollywood does remakes or whenever it does movie adaptations of popular novel heroes, it has to remember that it has to do more than just pay lip-service to its source material. It has to make sure that the script is damn good, especially if previous incarnations have been commercial successes and cult classics and some of the best movies of their era. And that is ultimately what let this movie down. I blame it all on a weak script. There were other factors which brought down the movie but none of them as strongly as the script. The movie starts out great as we get a peek into the history of the world and are told of the events which lay the seeds of what the story we are about to be shown will be. 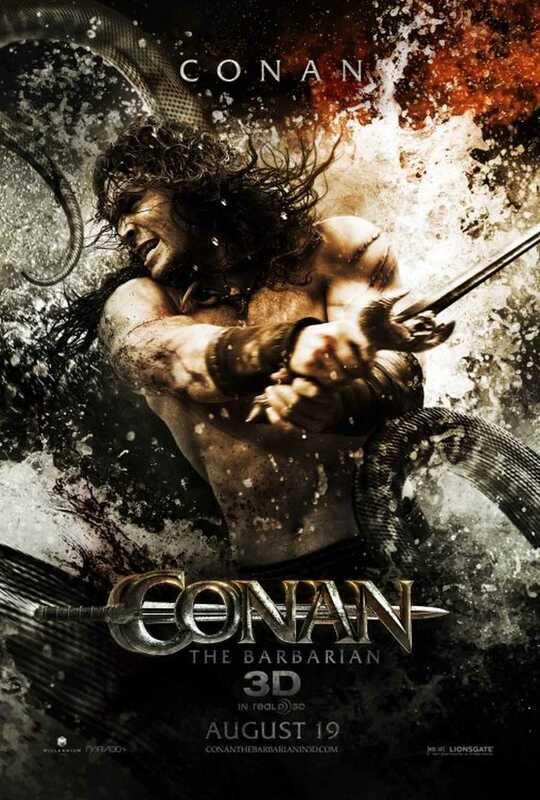 We see Conan’s dying mother give birth to him in the middle of a battle. We see again those scenes from the trailer where Conan proves he is as capable a warrior as any other in the tribe and a punk to boot. But soon after, the movie starts to go downhill. When you watch the scene from the original movie when Conan watches his mother being killed and contrast that to the new movie, where Conan has to watch his father being killed this time, you connect emotionally to the scene. 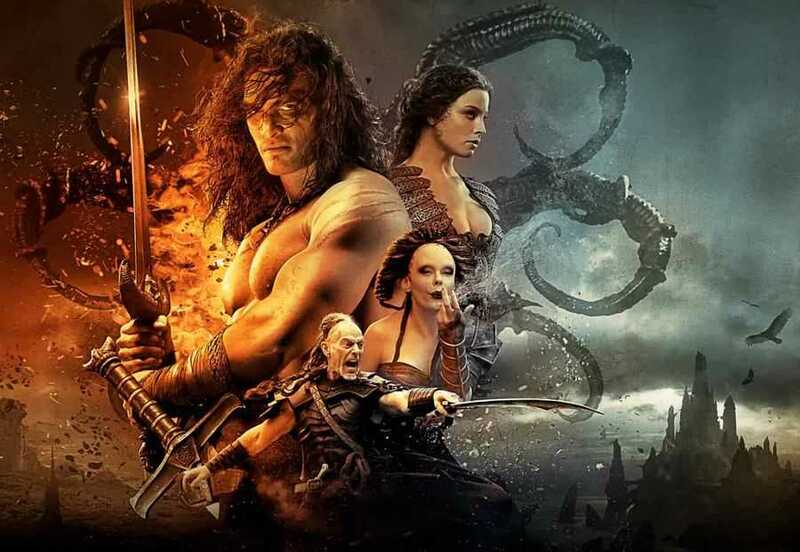 In that respect, the remake is stronger than the original because the original movie depended on the macguffin of Thulsa Doom’s strange powers and there was certain disconnect in the scene itself. Then you get the time-jump and Conan is now a pirate and a raider, although an honourable one for the most part, but one who still hungers for revenge for the death of his father and his tribe. After the previously mentioned scene, my emotional connect just started to fade. The plot just failed to work for me sadly. I kept comparing it to the original movie and the remake just doesn’t hold up well. There was too much jumping around of locations with little to connect the scenes together. We also don’t get any strong insight into the motivations of the various characters other than the superficial, trope-y fare: I want revenge for my father and my tribe, I want revenge for my dead wife, I want to become a god, I am daddy’s little girl, I am just a random girl who is caught up in events too far above my understanding and so on. I’ll definitely give the story an F. With what the writers had to work with, they could have made it so much more better. But they failed to deliver. The movie could just have been about Barbarossa the Barbarian, same as how the third Conan film was remade as Kull the Conqueror starring Kevin Sorbo. The acting was a hit and miss, but largely a miss. Momoa almost had the gravitas and the charm and the presence to carry his role as Conan. He almost matched Arnie himself. They key word is almost. He just couldn’t pull it off. When you watch the original movie, keep an eye out for Arnie’s facial expressions whenever he swings his sword or bashes someone’s head. Watch out for his swagger. Momoa delivered a decent performance but that was all that can be said about it. It was decent, neither good nor bad, just decent. Leo Howard as the young Conan was extremely enjoyable in his few scenes because he is the one who had the most character development in the entire film. The kid got his expressions down great and he really appears to be what his character was meant to be and is stronger than Jorge Sanz’s own young Conan in the original. Big props to Howard for this one. Ron Perlman was better than decent of course. He only suffered because he didn’t have a strong role in the film or enough screen-time. Otherwise this guy was okay. I definitely would have appreciated watching him in real action, fighting against multiple opponents and what not. Rachel Nichols as the potential love interest was, again, decent. She didn’t really wow me with her performance although I do think she carried herself well enough. And she does look pretty. She has that sort-of next-door-girl charm that works well for her, like in the horrible G.I.Joe movie of recent times where she was one of the few good things in it. Her action scenes and her character arc were respectively awesome and decent. With a stronger script, she could have been phenomenal, possibly as good as Bergman was in the original movie as Conan’s lover Valeria. Stephen Lang as the villain Khalar Zym was totally flat. He played a fairly stereotypical character and his performance was below average for such a role. At no point during the movie did he exactly instill in me a sense of emotional connect as to his motivations or with his performance. He could just as well have been playing the part of a lackey in the film for all the good he did. This was a case of a bad script and bad acting. Totally unworthy of being in a Conan film. They should have just brought back James Earl Jones who played Thulsa Doom in the original. The movie would have made some more dollars at the box office that way. And finally, Rose McGowan. I would describe her character as a sniveling girl who just wants her daddy’s attention. Within the bounds of that description, McGowan certainly performed decently, but she wasn’t quite there and again, her performance was decent as well. Her best parts in the movie include the scene where she raises a sword in the air and gives a roaring order to attack a monastery and later, when she is killing the female monks of said monastery. She captured the villainous nature of her character quite well in those two scenes. Everything else fell kind of flat, making her performance merely average. None of the supporting actors made any kind of impression on me unfortunately, for none of them were strong enough. Khalar Zym’s lackeys consisted of the entire range of villains: the killer bully, the giant of a man, the fat guy who has dreams of grandeur, and the faceless guys you never really care about. Now compare them to Thulsa Doom’s two subordinates in the original movie and you can see a difference. Those two were two-dimensional of course but they still had a presence in their roles and were a match for Arnie in their action scenes. None of that here. Saïd Taghmaoui’s thief Ela-shan also compares unfavourably to Gerry Lopez’s Subotai from the original movie. Such a letdown in terms of performance and dialogue. It is only the dialogue itself that tells you he is a master-thief, not the plot, which is another letdown. A wasted opportunity. His Breaker in the G.I.Joe movie was a much better. Along with Rachel Nichols, who played Scarlett in the film, he is incidentally the second actor from that movie to land a role in the Conan remake. Compare him to Nichols and his performance is an even bigger letdown. As for the film’s visuals and locations and monsters, nothing really struck a chord with me. The sand devils were like the Undead Egyptian warriors from Brendan Fraser’s Mummy movies. The octopus thingamajig in the showdown location was rather boring and flat. The hero was never in any danger from either of these and that is painfully obvious in the film. The castles and the monastery and the various cities were rather boring as well because there was nothing distinct about them. They look good only from a distance. Another wasted opportunity there. So do I recommend the film? Eh, it’s a hit and miss movie. Don’t go in expecting greatness, that is for sure. I almost consider this movie not worth the price of admission. Almost is, again, the key word here. If you want a film where you don’t have to think about things and you don’t have any preconceived notions of what to expect, then the film is for you. All in all, given how little I liked the film, I’ll give it a Swords rating of 2. It gets that extra point more than Immortals because it nowhere near horrible as that film. Posted on February 8, 2014, in Movie Reviews, Review Central and tagged Bob Sapp, Conan, Conan the Barbarian, Fantasy, Film, Film Review, Heroic Fantasy, Jason Momoa, Leo Howard, Lionsgate, magic, Marcus Nispel, Movie, Movie Review, Pirates, Rachel Nichols, Remake, Review Central, Robert E. Howard, Ron Perlman, Rose McGowan, Saïd Taghmaoui, Stephen Lang, Swords and Sorcery. Bookmark the permalink. 1 Comment. The original film is considered a classic by many which makes it hard for a modern remake to live up to the high standard that many hold for the original film. Overall it was an entertaining film, but many revert back to the famous Arnold sword battles while watching this modern remake.